I was sitting in traffic not too long ago listening to talk radio when I thought of an analogy for the economy and why trickle-down economics just don't work. I thought this analogy was simple to understand and relatable to everyone - especially those who have been stuck in traffic. 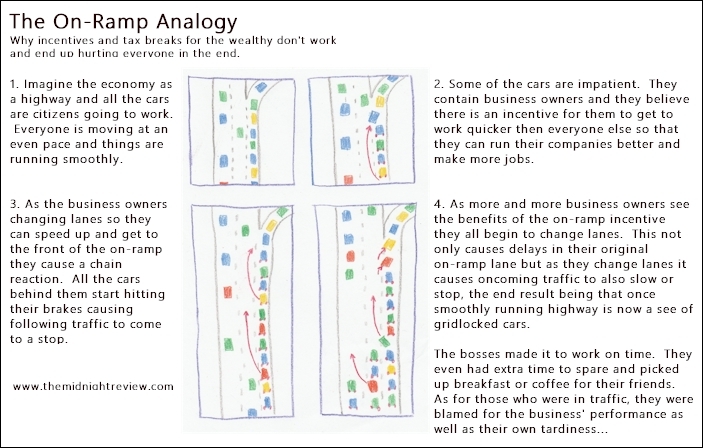 I call it "The On-Ramp Analogy." Imagine the economy as a highway and all the cars are citizens going to work. Everyone is moving at an even pace and things are running smoothly. Some of the cars are impatient. They contain business owners and they believe there is an incentive for them to get to work quicker then everyone else so that they can run their companies better and make more jobs. As the business owners changing lanes so they can speed up and get to the front of the on-ramp they cause a chain reaction. All the cars behind them start hitting their brakes causing following traffic to come to a stop. 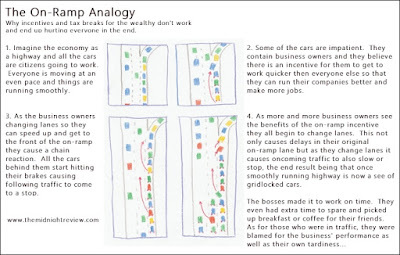 As more and more business owners see the benefits of the on-ramp incentive they all begin to change lanes. This not only causes delays in their original on-ramp lane but as they change lanes it causes oncoming traffic to also slow or stop, the end result being that once smoothly running highway is now a see of gridlocked cars. Next time you are in traffic and you are sitting at an on-ramp pay close attention. You may notice that it seems cars are moving at a decent pace at the front of the line. Not too fast but not too slow. Then take a look down the line and the lanes beside it. You may start to notice cars cutting in or getting out of line to move to a better spot. Now look behind you. Notice the standstill down the highway?